I'm thinking of getting this print of a Gustav Klimt painting. Isn't it beautiful? 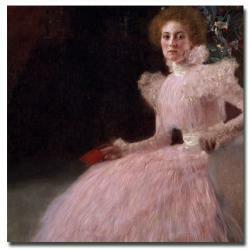 I love the pink in her dress and think it will look great in our charcoal grey living room. Its a clean out the closet day. I have so many clothes and shoes in my closet that I don't wear for one reason or another. So I think its time to go through every single thing and figure out what I like and what fits. From there I'm going to make a list of things I need and start putting together a wardrobe I am happy with. I really want to feel good in my clothes and like they reflect who I am. Its a little overwhelming because my closet is an absolute disaster zone at the moment. This weekend is going to be wonderful. First, R doesn't have to work, which is awesome! We are going to do some home projects and hang some shelves in our bedroom to hold my nail polish and jewelry (speaking of jewelry I really should go through all of that too). We are also going to go on a date. I really am craving vietnamese food so maybe we will go to one of our favorite little restaurants called Pho. I can't wait!